We are located at McKenzie's BBQ. Jehovah Jira - Thank you Father for your provision and grace. Pastoral assistance with grief, because everyone needs hope with life's challenges & solutions. The following is my statement of faith as to how, why & when Christ brought me into the ministry of Refuge In The Night. 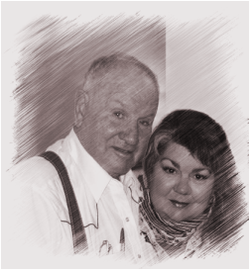 On March 16th 2012, Jesus took my beloved husband to live eternally with him. I was devastated, angry, afraid, lost, hurt and lonely. The moment he died, I missed him immediately. How could God have taken him from me. How could I go on???? He was my best friend. We shared everything together. For 20 years I had worked by his side on this ranch. In just a few brief moments, my life changed forever. Now Nothing will ever be the same. Tom Carter was truly a gift given to me from God, and I cherished him. What was even sweeter, he cherished me. We were married 19 years and 3 months. I thought we had longer. Even though he was 17 years older than me. We both had talked about the possibility that I would go before him. ( our reasons for this belief no longer exist) Our love story started with a letter. I was 43 years old with two precious children. My marriage of ten years had ended in betrayal. I had been here before, this was my second failed marriage. I was angry. Angry with myself, God, and everyone. I was raised in a Christian home, where marriage meant forever. My parents were married 50 years. However, I learned the hard way, this was not always to be the case. It takes three to make a marriage work. You, your spouse & God. If one is unwilling to stick out the rough times, you cannot make them stay. Twice I made the wrong choice in a mate, and at 43 I had become bitter. From now on just God, the children and myself was all I needed........ Most definitely no one else. The following is a true story of God's amazing love in the lives of three broken people. One night, as my second marriage was ending, my daughter came to my room and asked, " Mama would you pray with me for God to send us a new daddy?" I said no! With hurt eyes she turned and went back down the stairs. The next night again she came to my room just before bed time. ''Mama would you pray with me for God to send us a new daddy?" again I said no! This went on for about 10 or 12 nights. Finally, as she came up the stairs I waited for her request. Then I told her, many years ago I wrote God a letter two different times and both times he answered me right away. Tonight, we will write God a letter then put it in my Bible. She was delighted. I began the letter with Dear God, first of all, we need a man that is truly a Christian, not one that pretends to be, then ten years down the road gets tired of pretending and reverts back to who & what he truly was. Secondly, we need a Boaz. In the book of Ruth, Boaz cared for Ruth's mother-in-law and Ruth. He let Ruth glean in his wheat fields for food and sent carts of wheat to Ruth and Naomi's home to feed them. Oh God, I need a man who would truly love me, and love my children as though they came from his own body. A man that would help me take care of my elderly parents. I wanted a truly unified family and did not want to have a different last name than my children. I needed someone to adopt them. The kind of man a girl dreams of in her childhood when she reads fairy tales ( I loved cowboys, ranches, and farms, Navy men & football players). Growing up, John Wayne and my Dad were the perfect men, in my childlike fantasies. I had seen John Wayne play cowboys in the movies, He was always on the side of truth, honor & God. I knew he was a football player in his youth and made movies about WW2. My Dad fought in WW2 in the Navy, A fighting Navy Sea Bee. I looked up to my dad, He was tough, strong, smart, a good man, good husband and a good father. He spoiled my mother, my sister and I, with love and treasures he would bring home from time to time to us for no reason, He just loved us and we loved him.I always felt safe in my home and I needed this combination of a man for me and my children. So, I was very specific about what I thought we needed. The kind of man to live with us and love us the rest of our lives, a man we could love and respect. I did not want a pretty man, I wanted a rugged man. We needed a man that, would be gentle but firm and would teach my son how to be a man. There were several other important requests on my list and they were between me and God. The last thing I wrote was: He would have to come looking for me. I would not go looking for him. As my daughter read the letter, she said .... Oh, Mama there is no such man. I told her that's what we have to have and if he is out there GOD will send him. She rolled her eyes, accepted it, then we put the Letter in my bible. I went to bed but ask God that night; Lord if you have someone for us, we need him now not five years from now, then fell asleep and forgot about it. Two weeks later, I was at a rodeo where my children were participating in the events. I was the leader of the 4-H horse club as well as a substitute teacher in a small town. My divorce had been very ugly, and very public. At times, I just wanted to disappear. Seems everyone was talking about my business. I had made up my mind the next person rude enough to ask me my personal business. I was going to chew them up and spit out in front of God and everybody. The following Saturday, the children and I were to come to Tom Carter's three-acre pea patch and pick peas every other day till the peas played out. We worked two months to pay for the horse. On the first day of picking. We had been there approximately 4 hours when Tom drove up. The back of my truck was full of peas. (8 to 12 bushels or more). I asked if he would like us to shell, blanch, bag, and put these peas in his freezer. He said no, take them home with you and put them in yours & your mother's freezers. He started walking off to his truck and said he was on his way to a roping. I hollered at him, saying I didn't come out here for free peas, we had a deal. I kept hollering Mr. Carter... Mr. Carter....as he drove off. Again, I was livid, no man was ever going to control me!!!!!! My daughter was standing in the field, looked at me with amazement then she said " Mama, Mama, What!!!!! I said. I'd call that a Boaz," we are gleaning in Mr. Carter’s the field just like Ruth'' ....I was so mad as I hatefully said to her " why don't you just shut up!!!!!!" I left the field with my truck full of peas that needed to be shelled. The children and I shelled them and froze them. Because of Tom's kindness, we had a good staple of purple hull peas in both my mother's and my own freezer. We worked in his pea patch the next eight weeks, picking his peas till they played out. The horse was now ours. 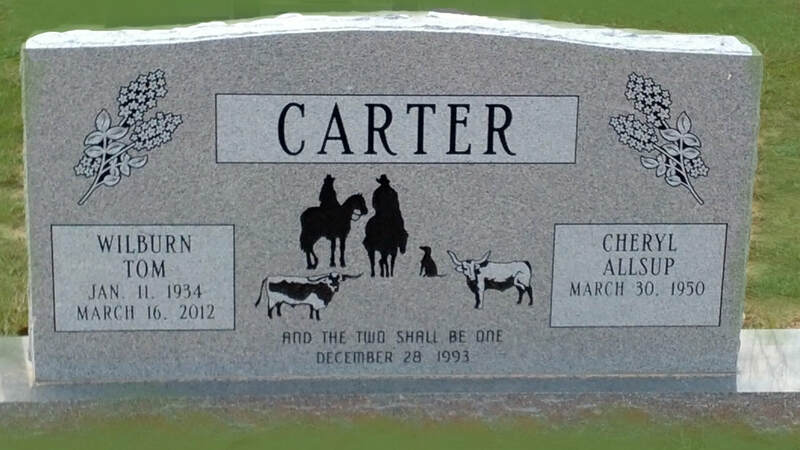 We ended up working for Tom Carter on his ranch. Spring passed into the days of late summer. 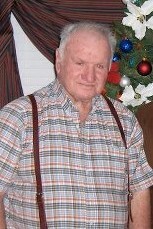 He taught us how to drive tractors, cut, rake, roll and bale hay, we fed large herds of cattle and horses. I tore up every piece of equipment he owned out of inexperience and ignorance. He never got angry with me. 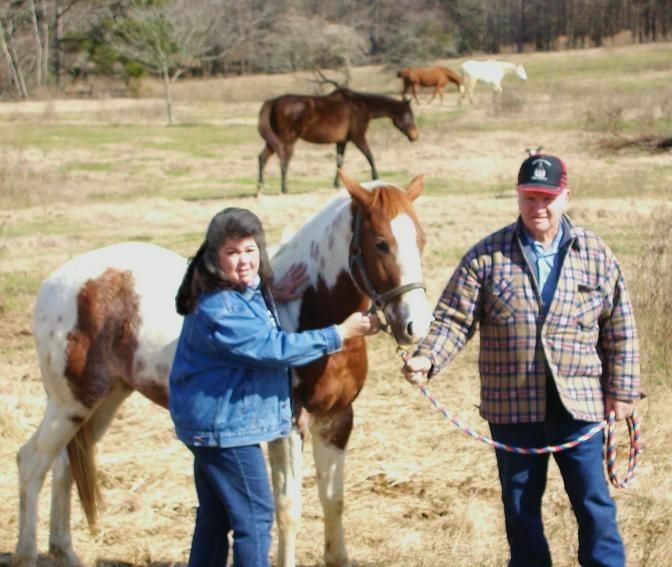 (throughout our lives, he always showed me and the children great patience) One day we were standing and talking, on a piece of the property that was the most beautiful on his ranch. The children and I had been working on his place for a few months. He said to me that day" you've changed your mind about me, but you don't want to admit it". I told him "Mr. Carter, if I told you why I have changed my mind about you, you would probably write me a check, pay us for the week's work and send us on our way". He said ''what are you talking about...... I told him about the letter. When I finished, he said "well what do you think about this place" I could not help but think...... back a man in a corner and he will change the subject every time. I told him he had a beautiful ranch. He said "good, good, then I guess this is where your goanna spend the rest of your life." That was in the summer of 1993. That Christmas we married December 28th. The following February 18th, he adopted the children. For the next 20 years I was a rancher’s wife and I loved it. I did things I never believed I was capable of. Like Pulling calves, operating on horses & cows, driving the tractor, and Tractor-trailer on the ranch, unloading liquid feed into huge vats at 3 am in the rain, cold & mud. Hauling hay from pastures as far away as Louisiana, to penning cows then hauling them to the sale barn. We soaked it up & loved all of it. God blessed me with the desires of my heart. God gave me the love of a man a good man a real man, that walked with God, he was the real deal in every way. If he made a mistake or was wrong, he admitted it, then we moved on from whatever the problem was and life was good. The work was hard work but good work. He taught us how to plant gardens and how to feed ourselves. When cutting trees, we learned to choose our forests land wisely, never clear cut and always protect the land. Because God isn't making anymore. He was the smartest, finest, best man I ever knew. He shared his knowledge with us and we are better for it. He was college educated, many times in the years we were together. I would hear people in the community say things like ,Tom is a highly intelligent man and a genius with numbers. I never heard a bad word about him, never heard a lie from him ever. We were a family that God put together. God granted me the desires of my heart and we were so blessed. Tom Carter saved our lives through the direction of God's masterful hand, and for the first time in many, many years our life was good because of God and Tom. That's what both of the children told our pastor ( Josh Henry) when he was preparing Tom's funeral. My children could see, even in their young ages. That the bitterness growing in my heart for men was destructive. Destructive to me and most definitely to them. In our greatest time of need, God answered a simple letter written by a child and her mother. God, through Tom Carter, saved our lives. We were blessed greater than these simple words can say. We grieve over our loss. We miss this Giant of a man that filled our lives for 19 years & 3 months. However, Tom is not dead to us. I feel him here everywhere every day on this ranch. I will love Tom Carter forever. He was one of my sweetest gifts from God. God has given me some awesome gifts, salvation, my children, Tom, to mention just a few. But God gave us something else too. We had visited & attended several churches after we married. But Tom and I had been wounded by the traditional church. He and I had both been raised in church. Yet the church had no real place for us or our talents because, I was his 4th wife & he was my 3rd husband. It is one thing to have this history as a non-Christian & then become a Christian, all is forgiven. But to be a Christian and have this track record is shameful. (not to God but some believers) a Cowboy preacher, starting a Cowboy Church with 12 people, reached out to us and invited us to attend Trail Of Life Cowboy Church. There we found a home. Tom never missed a service. The church has grown to well over a 100 to 180 in attendance. They were our family. I guess I could have grown a bitter heart again over loosing Tom, but through my church family, Jesus Christ, Father God, and the Holy Spirit, there is truly Refuge In The Night. My pain had been so great. Just to breathe hurt more than words could express. I wanted to go with Tom, so I waited to die. I thought of June Carter and Johnny Cash. June, the beloved wife of Johnny died. Four brief months later, Johnny followed her in death. In my grieving mind, I just knew God was not going to separate us now. So, I waited for Jesus & Tom to come for me. I was alone now, my children were now adults, they had their own lives. They did not need me, and I did not want to live in this big house without Tom. But that was my plan not God's. I do not know why God took Tom at this time. But I trust God. I simply know God is right in all he does. My peace comes with these words, "John 11:25 I am the resurrection and the life." I am not a widow, I am still a wife, Tom Carter lives. One day he will returne with Christ to take me home. But until then. The God that created me, and breathed life into me, has work for me to do yet. I am ready to do my father's work. No matter how small, or wherever He takes me. In the dark, still moments of the night, the sunshine of the day, or pouring rain. I will follow Him. Refuge In The Night. A ministry that has many branches from God's tree of service. The LORD is my rock, my fortress, and my deliverer; my God is my rock, in whom I take refuge. He is my shield and the horn of my salvation, my stronghold. Weeping may remain for a night but rejoicing comes in the morning.
. I pray Blessings over all who find their way to this site. Weeping may remain for a night, but rejoicing comes in the morning. Though I walk in the midst of trouble, you preserve my life; you stretch out your hand against the anger of my foes, with your right hand you save me. When calamity comes, the wicked are brought down, but even in death the righteous have a refuge. Though the mountains be shaken and the hills be removed, yet my unfailing love for you will not be shaken nor my covenant of peace be removed, says the LORD, who has compassion on you. And this is the will of him who sent me, that I shall lose none of all that he has given me, but raise them up at the last day. For my Father's will is that everyone who looks to the Son and believes in him shall have eternal life, and I will raise him up at the last day. Jesus said to her, “I am the resurrection and the life. Whoever believes in me, though he die, yet shall he live, and everyone who lives and believes in me shall never die. Do not let your hearts be troubled. Trust in God; trust also in me. In my Father's house are many rooms; if it were not so, I would have told you. I am going there to prepare a place for you. And if I go and prepare a place for you, I will come back and take you to be with me that you also may be where I am. You know the way to the place where I am going. Because those who are led by the Spirit of God are sons of God. For you did not receive a spirit that makes you a slave again to fear, but you received the Spirit of Sonship. And by him we cry, "Abba, Father." all your anxiety on him because He cares for you. You anoint my head with oil, My cup overflows. of my life, And I will dwell in the house of God forever. I can do all things through Christ who strengthens me, and he strengthens me everyday. Please contact me. I would love to know your story & I will pray with you for Hope,Love and understanding.